Our firm is pursuing Johnson & Johnson who is the leader in manufacturing and selling talcum powder based products to consumers. Claims can also be asserted against distributors of the product in some instances. It seems clear that they are knowingly selling a product that has the potential to cause catastrophic harm to consumers. The Johnson & Johnson advertisements have persuaded women to use their talc powder products for a “fresh and clean feeling”, when in fact, it has life-threatening risks, but fail to warn of those risks. 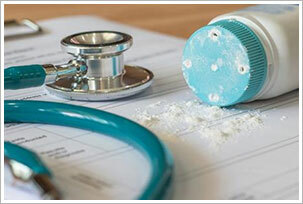 How Do I Know If I Have A Viable Case In A Talcum Powder Lawsuit? If you are a woman and have used talcum powder consistently over a course of years and have been diagnosed with ovarian cancer, you likely have a viable case if your pathology reports test positive for talc. Ovarian cancer is a leading cause of death and thousands of women in the United States die each year from ovarian cancer. Our firm is representing women who have used baby powder without the fair warning of its side effects and risks and who have been diagnosed with ovarian cancer as a result. How Do You Prove That Your Symptoms Or Cancer Was Caused By Talcum Powder Use? One way to prove if talcum powder has a role in ovarian cancer is to send the pathology reports to an ovarian cancer expert to review the reports and samples. Talcum powder can be found in the ovaries, fallopian tubes and pelvic lymph nodes and take years to disintegrate. The same tissue samples that were used to diagnose the ovarian cancer can be tested for talcum powder. In most states there is a statute of limitations on these types of lawsuits. It is important to contact an attorney as soon as you may think you have a case. The first step is to contact us today. We will work with you to determine if you have a viable case against Johnson & Johnson and will help you obtain the compensation you deserve. What Type Of Compensation Might Be Available To Plaintiffs? Ovarian cancer is life-threatening and often times leads to death. The compensation certainly varies from case to case. It depends on the severity of your damages. For example, how has it impacted your daily life? Are you able to continue participating in your favorite hobbies, perform at your job, etc. In the most recent cases, Johnson & Johnson was hit with a $55 million verdict. This compensation in that case is for physical and psychological harm, disability, lost wages and medical expenses as well as punitive damages. Not all cases are going to result in this type of an award but these are serious cases and at some point, Johnson & Johnson is going to have to stand up and address these claims in a fair and responsible manner. How Long Might A Lawsuit Like This Take To Be Resolved? Any good lawyer will tell you that there is not a definite time when it comes to a lawsuit being resolved. But, at the start, we will begin by gathering all facts surrounding your potential talc powder case and that will gradually determine the resolution time frame. It can be as short as a year or as long as a few years. However, the number of cases in this area of practice are growing and consumers and manufacturers are becoming more aware. Currently it is impossible to accurately estimate how long the process might take. Johnson & Johnson is vigorously defending these lawsuits. Why Have Settlements Not Yet Been Paid Out On These Cases? Johnson and Johnson is defending against these lawsuits and taking the position that their product is safe and did not cause ovarian cancer in the women that have sued. They also take the position that the science connecting the cancer with talcum powder use is faulty and not to be trusted. To admit otherwise will open them up to liability that they are not ready to accept. Therefore, there will have to be more trials in which the victims are successful before settlement discussions have the chance of being fruitful. What Sets Your Firm Apart In Handling My Claim? With years of experience in medical device lawsuits, Parker Law Firm understands the steps to take and processes to follow to ensure your case is filed and you receive the compensation you deserve. We keep you informed every step of the way, so you are never left in the dark. We work closely with others in order to obtain the best results as fast as possible. At Parker Law Firm, we have a saying, “People matter”. With more than 30 years of experience, we are dedicated to helping you during a difficult and tough times. This is something that we practice NOT just say. Your concerns and worries are our utmost priorities. Not only are we dedicated to pursuing your claim, we are dedicated to helping you. It is our honor and a privilege to represent clients who have suffered as a result of the wrongdoing of a company which has knowingly failed to properly warn of the life changing side effects of the product it manufactures and sells. Call us today for a free consultation and strategy session. For more information on Primary Allegations In Lawsuit, a free initial consultation is your next best step. Get the information and legal answers you are seeking by calling (817) 503-9200 or by filling out a contact form.